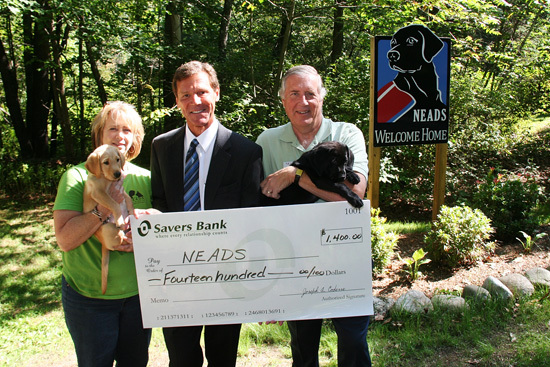 Southbridge, MA (September 12, 2012) – Savers Bank announces a $1,400 donation to NEADS, a non-profit organization established in 1976 to train and provide canine assistance for people who are deaf or have a disability. As part of the donation, Savers held a “Name that Puppy” contest allowing customers and employees to offer name ideas VIA Facebook for a new eight week old arrival puppy entering the NEADS program. “NEADS makes a commitment to their clients to offer the best trained dogs to improve the quality of life for the disabled. We are happy to contribute to this organization and are also excited for the opportunity to name one of the new puppies entering the program,” commented Joseph Coderre, President and CEO of Savers Bank. NEADS has trained over 1,400 assistance dog teams and has a larger variety than any other program in the US. People with balance and stability issues, wounded combat veterans, children on the autism spectrum, children with a physical disability and people with a variety of physical disabilities often reach out to NEADS for their aid.